Description: a KCKPAS heads up Mullan Pass with 737's in tow. Description: The ex-WC Transfer departs Northtown headed for New Brighton and beyond. Trailing unit is CN 5664. Description: IC 6122 crosses over Old Highway 8 on its way to Humboldt. This would be my last time seeing a train cross this bridge as for it is going to be replaced tomorrow. It is probably about 60 or so years old. Description: This is the Northtown part of the transfer. The crew is waiting to get a track at Northtown Yard. Description: A405 has just arrived at New Brighton around 1:30 PM, thats about 10 hours later then usual. As a result, the transfer was made into two trains with the IC going to Humboldt and the CN going to Northtown. 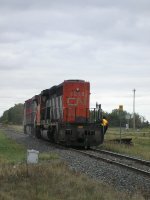 Description: The trailing SD40-2W. These dont have too much longer on this CN, so shoot them while you can. Description: Light units resting in town. Description: A little wider shot.